Having immersed myself in the extensive detail of Brexit for a long time now I have reached a point where there is little more that I can add for the time being. There isn’t much point either. As yet the wider media has yet to catch up and the public debate is lamentable. Rather than seeing a full and frank exploration of the issues we are seeing the usual tribal bickering which has little direct relation to reality. The politicians really have no idea where to start in terms of evaluating the issues. The big question is whether Brexit will trigger a widely predicted recession. That estimation depends really on who you are and what the word recession means to you. In technical terms a recession is two successive quarters of negative growth. To the man in the street it means things go bad and get worse. We may not see a technical recession but we could very well see inflation that has a real effect on household budgets. The net effect of this will be to reduce domestic demand, changing buying habits. This means that the UK government will be forced into moves to make the UK more business friendly and more tax efficient. But by the same token it may lead to a complete abandonment of fiscal responsibility resulting in more borrowing. I suppose that will be the defining choice at subsequent elections. What that means is that political parties will need to examine what new powers are at their disposal and define policies aimed at reducing the impact. For once there will be a real conflict of ideas rather than the stagnant and plodding consensus of recent years. Be it a swing to the left or to the right, it will have to be radical. This is the reawakening of politics I voted for. This escapes those commentators who would rather we remained in the EU. 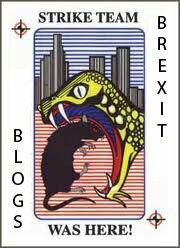 They are quick to assert that British voters were deceived and have voted for an economic catastrophe. It is a convenient and comforting narrative for remainers but it strays from the truth. If there is one message that can be taken from the referendum it is that Britain voted for change. It is wrong to assume that British voters were so bovine that they believed the tabloids over the advice of experts and prestigious institutions. Quite early on I concluded that they were probably right in that there would be a recession and economic turmoil lasting many years. The question at the forefront of my estimations was whether it was worth the gamble. I still think it is worth it. By voting to leave the EU we have caught the entire system of government off guard to show that is is totally ill-equipped to govern - and those claiming to represent us have failed in their duty to safeguard our democracy. Through forty years of negligence the UKs trading relationship with Canada is decided not by Number Ten or Westminster. Instead it depends entirely on the Walloon assembly in Belgium. For decades we have tolerated the European project because there was always the promise of sunlit uplands and prosperity for all. It hasn’t happened. The EU that remainers speak of exists only in their imaginations. Greece and Italy struggle with grinding poverty worse than anything you can find here in the UK. As ever the EU debate is conducted in a parallel universe. Now that we are entering a new era of global governance where the EU is side-lined entirely we find we lack the necessary democratic tools to defend ourselves from runaway globalisation. The EU is not fit for purpose and its institutions rest on ideas pre-dating the internet. It exists for the vanity of the politicians. We have run out of patience. As part of the post-war architecture its institutions are unable to cope with a massive upheaval in geopolitics and the response to every crisis is procrastination and delay. We can’t afford it. It was never a choice between a rosy status quo and economic turmoil. We face hard choices either way. Rather than bury our heads in the sand we have chosen to set a revolution in motion. No longer will we kick the can down the road. Nobody can say for sure what the long term outcome of Brexit is. What we do know is that Britain will survive. The EU may not. That which is authentic will stand the test of time. That which is artificially imposed without the consent of its peoples will always implode sooner or later. And so Brexit was a leap of a faith. An estimation of where our long term prosperity lies. In that, we chose democracy warts and all. We may pay a price for that choice, but you don’t have to go back too far to see that we would pay any price for democracy – time and again.